Mix again and pour in 1 cup chocolate chips, or 1 cup blueberries. If the mixture is really runny then you need to be more heaping with your flour. Add some more flour in. Grease 18 muffin tins, (I just spray them with PAM), fill each tin 2/3 of the way to the top, and pop them in the oven for about 18 minutes. I guarantee that these will be on the breakfast table at our home on this Monday, our first day back to doing school full-time. 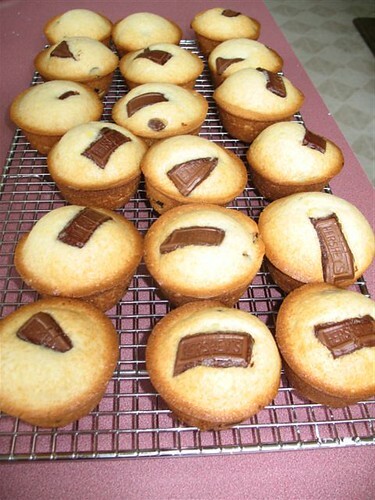 Oh, and if you have a chocolate-lover-kid like MK put a Hershey Kiss into the muffin instead of chocolate chips. Those are great too.